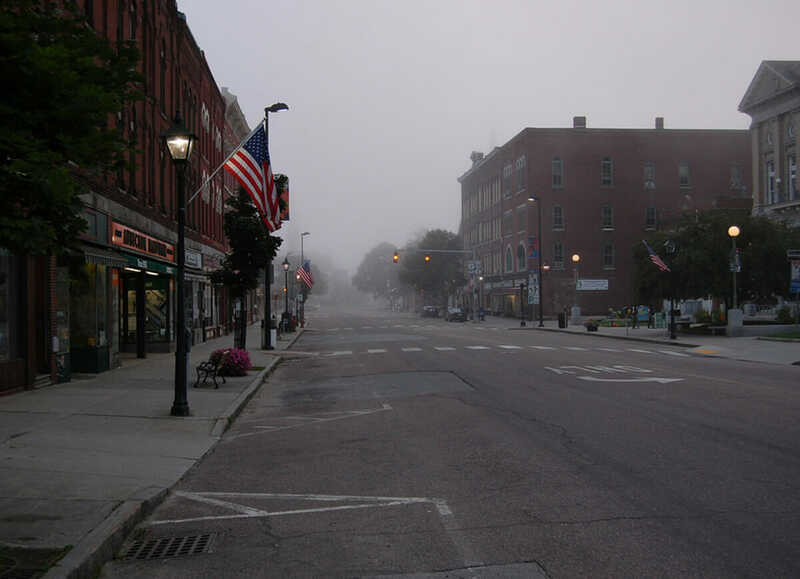 Is the Economic Recovery Leaving Rural America Behind? The shifts in our economy are changing the urban/rural divide from a tenuous line to what increasingly feels like an unbridgeable chasm. But urbanites shouldn’t rejoice; a widening gulf between rural and urban America isn’t good for anybody. That is because city dwellers and country bumpkins need each other, even if at times both sides may hate to admit it. Cities rely on the hinterland for resources and food just as most rural countries count on cities for tax subsidies and buying power. But the shifts in our economy are changing the urban/rural divide from a tenuous line to what increasingly feels like an unbridgeable chasm. The most surprising statistic in the report is the sudden population loss in rural areas. 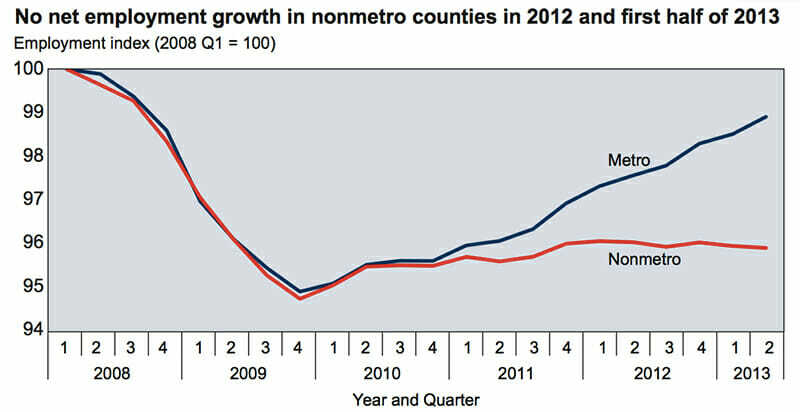 Between April 2010 and July 2012, almost 44,000 people left non-metro counties. While that might sound small, it marks a significant shift from population growth in rural America prior to the recession. Such a loss comes with many unwanted side effects, including a reduced demand for jobs, lower wages and higher per capita costs for providing social services to rural communities. census. Source: USDA, Economic Research Service using data from the U.S. Census Bureau. Explaining the trouble varies from county to county, but one major factor the report cites is the decline in manufacturing jobs. Not surprisingly, urban centers tend to specialize in knowledge-based work, packing in scientists, engineers and executives. Rural America has more openings for machinists and makers. Not only have these hands-on jobs been lost to foreign countries and technical changes, but they also tend to pay less than desk jobs. In a press statement released last month, U.S. Agriculture Secretary Tom Vilsack called the report, “one more reminder that we need a national commitment to create new opportunities in rural America that keeps folks in small towns and reignites economic growth across the nation.” He noted the farm bill could be just such a ticket. Unfortunately, the bill remains locked in Congress between squabbling legislators and agricultural interest groups. Source: USDA-ERS analysis of Bureau of Labor Statistics-LAUS data. 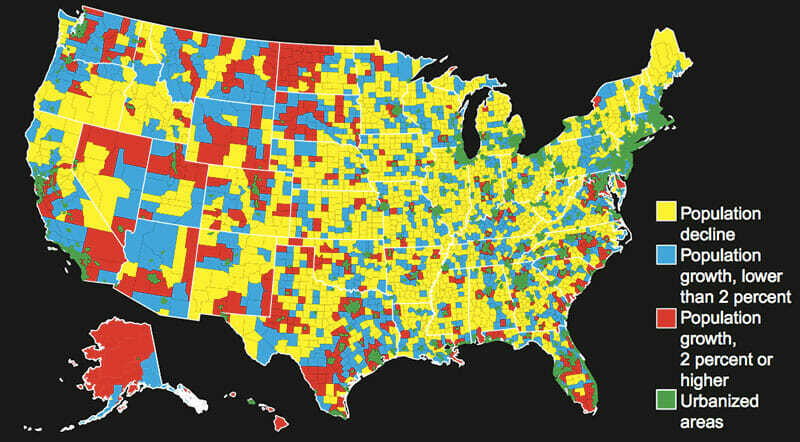 Not all of rural America is seeing tough times. Thanks to the oil boom on the Great Plains, some counties that once fretted over population drains now offer $300 signing bonuses to fast food employees and $50,000 a year salaries to gas station attendants. Even so, the modern gold rush has also brought new problems. A study by officials in Montana and North Dakota found a 32 percent increase in crime for communities at the center of the boom. Already, the division between urban and rural America has pushed parts of Colorado, Michigan, Maryland and California to consider becoming their own states. Like real divorce, political break ups require a few more hurdles than a simple yes/no vote (and, just to note, rural counties mostly voted “no” last November). Then again, rural counties hoping to succeed should be a wake up call for city folk: Rural America is fed up with the lack of opportunity.